I have been looking for some new 'going out' type of earrings for ages. 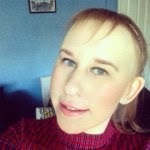 A few weeks ago I bought some from New Look which were similar to these new black ones in the photo. However, I wore them to the Bloggers Blog Awards and the main part of the earrings were flower shaped and a majority of the jewels fell out, so I returned them as faulty and was back to square one. Earlier this week, I went on a little shopping spree into Manchester as I really wanted some new earrings to wear this weekend for my friend's birthday. I have seen these black tassle ones (currently sold out online) which I purchased on lots of different Instagram's, and I love how they looked. Heads up though, they are selling these in H&M where I purchased them from for £8.99. However, Topshop have an almost identical pair but are charging £15. These must have sold well in H&M as they had them in at least eight different colours including navy, red, rose gold and white. I decided to go simple and pick up the black pair as they will go with any outfit. I think they will finish this weekend's outfit off perfectly. 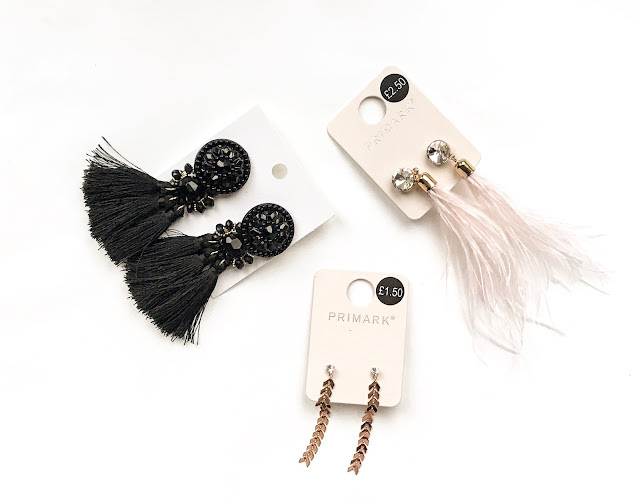 I recently saw on Primark's Instastories that they were finally getting in some new earring styles. Primark are usually pretty on it with trends, but I feel like they have been a bit behind with this one as big out their earrings have been in since the start of the season. Anyway, they did not have anything to similar to the chandelier type (the name I have given them! ), but they did have these two pairs which I picked up. The first pair are the white feather earrings, which also come in black. These were just £2.50, and I am definitely going to get a lot of wear out of these. The second pair I picked up are these daintier rose arrow plaited earrings. These were only £1.50, and I am very excited about wearing them as they are much more subtle. I am hoping that they add the finishing details and dress up different simple outfits. I am very happy with my purchases and I already know that all three of these pairs are going to be worn frequently especially leading up to the festive period.